The reaction encountered most often when mentioning that I like Bollywood films is that there must be something wrong with me. Of course this is just a perception, but it is felt. At one time I shared this attitude but it became even more relevantt as I still looked at Bollywood comedies as beneath me. I enjoyed some humour in more serious movies and in romantic comedies. I even enjoyed bits of Bollywood comedies, but found too much "over the top"
Early on it was explained that going to movies in India was a family affair. Young children, parents and the grandparents would go together--entertainment had to offer somethings for the kids (or they would become unruly), something for the adults and something for older women. The situation has changed with couples dating at movies or groups of students socializing. "Chalo Dilli" was seen mainly as a time killer, not profound or artistic. It followed a familiar pattern with a relatively sophisticated person paired with someone more crude and unaware of how they are perceived. After a series of incidents the plot leads to them appreciating one another as relatively equal humans. The initial contrast was pretty stark with a sophisticated Lara Dutta and Vinay Pathak playing the role of a crude bumpkin. There was a twist at the end that made it more poignant. Despite many almost slapstick moments the change in the characters was well done. The best remembered comedies have some sort of social meaning and this is no exception. The two main characters are constantly running into problems--missed flight, car breakdown, gangster intimidation, stolen money. The Vinay character breaks it down in steps to "it's no big deal"--while each event seems catastrophic. Lara's character undergoes a few changes, but often only temporarily. Vinay is crude (not vulgar) and that alone makes it difficult to accept.--at one point Vinay says that instead of crying he laughs. Vinay Pathak was one I associated with crude comedies, but looking over his movie list I have enjoyed a number of his efforts. In his first movie, "Fire," he had a very minor role in a movie directed by Canada's Deepa Mehta. It was very controversial in India as it portrayed a lesbian relationship. He later had roles in two other Mehta pictures, "Water" and Midnight's Children." I watched him in "Dasvidaniya",where he played a man wanting to do a simple bucket list as he knew he was dying. He had a strong supporting role in "Manoram Six Feet Under" a murder thriller. He played another strong supporting role with Shah Rukh Khan in "Rab Ne Bana Di Jodi." In " Bhejja 2" boisterous clumsy--tying up a tax inspector with a tax evader has comic potential. "Bheja Fry" in 2007 earned him a best actor in comedy role. (India breaks down acting awards to include both comedy and negative roles) Beja Fry stands for "fried brain." A sequel, "Bheja Fry2" did not get as good reviews, but set in motion for the upcoming "Bheja Fry3"
His starring roles have mostly been comedic. He is nothing like a leading romancer, Instead he is more ordinary, but as an actor he is versatile. Lara Dutta a former Miss Universe who also happened to claim the highest intelligence of contestants. In the movie she plays a beautiful, sophisticated, somewhat arrogant executive, but she does gradually modify her attitudes. She is listed as a producer along with her husband. Akshay Kumar has a bit role, but done well Plays husband of Lara Dutta and is very understanding. I am gradually warming up to him as he has taken on a number of socially relevant roles while still maintaining leading man status. Arshad Sayed, the writer worked on "Davidaniya," "Hum Tum aur Ghost" and also on some prolific tv series. 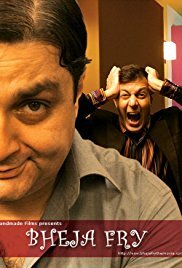 An enjoyable comedy I had seen just before was "Phas Gaye re Obama" with Rajat Kapoor, a frequent co-star with Vinay (you can also see him the background of the Bheja Fry poster). It had some clever plotting and a social message. It was about kidnapping rich people, but in this case Rajat had returned to sell some property to cover his overwhelming indebtedness. Still he was able to con a series of kidnappers "I have an idea" repeated after each setback . Actors like Vinay Pathak and Anupam Kher have to be versatile and especially in their early careers accept any reasonable role they can latch onto. As time goes by other opportunities will open up. Many times I feel the world is absurd. Why not laugh?